I wrote these questions to assist 5th grade students that had difficulty reading, but had strong comprehension skills. The lower level text allowed them to independently read the text and still be exposed to grade level comprehension questions. This could also be used with above level third graders to expose them to higher level questioning. 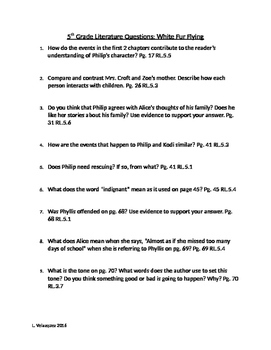 The questions cover the reading literature comprehension standards. This could be used for guided reading, literature circles, independent practice, or whole group instruction.